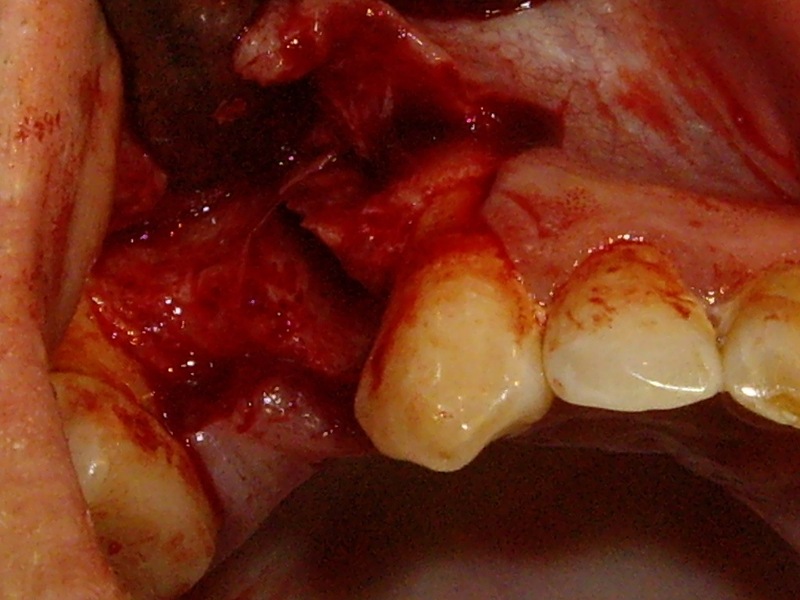 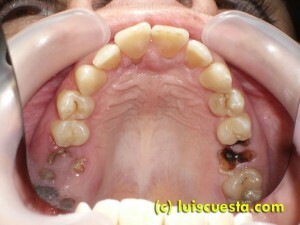 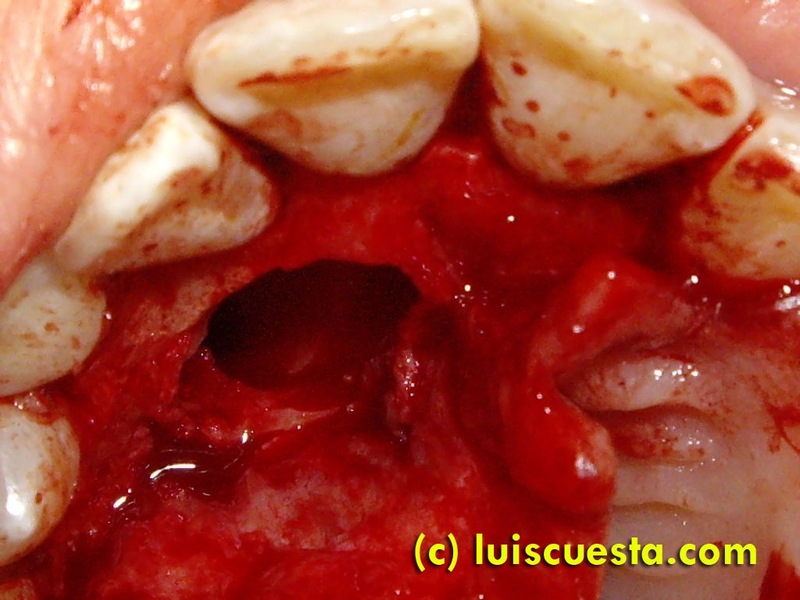 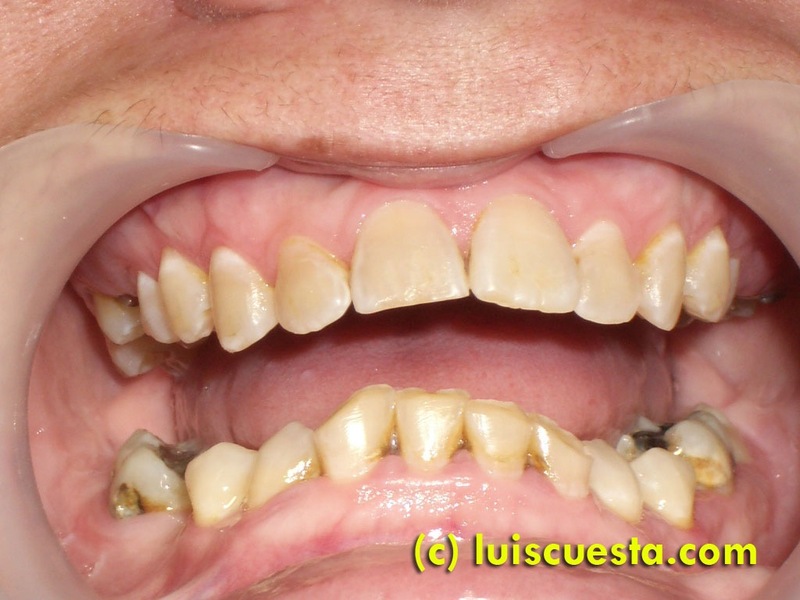 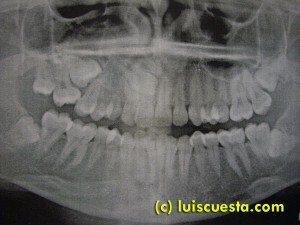 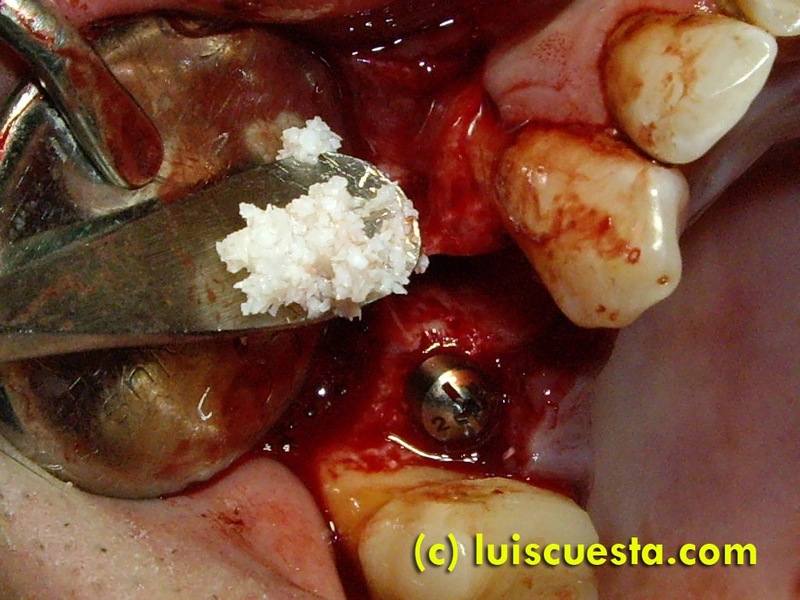 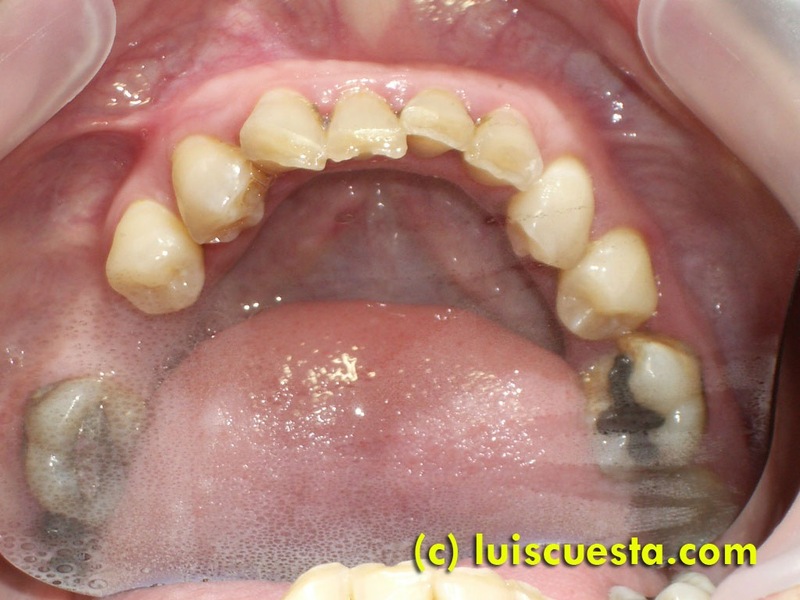 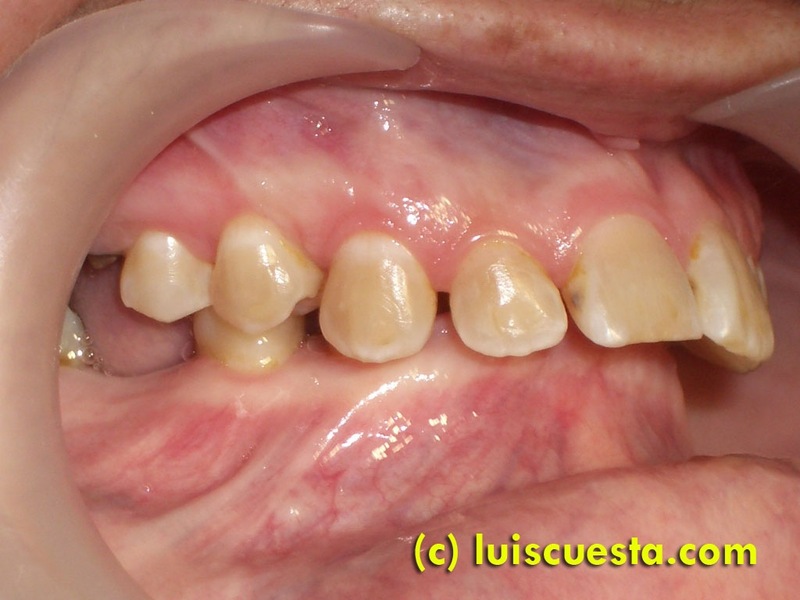 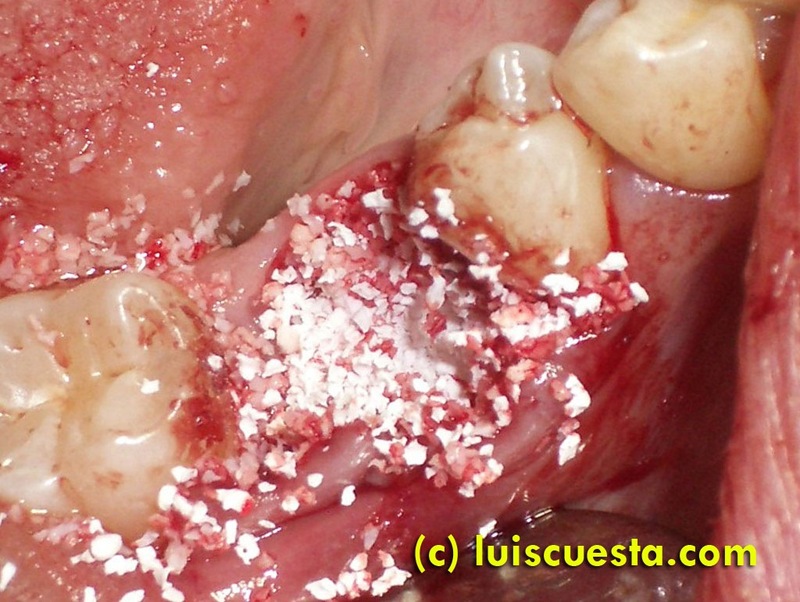 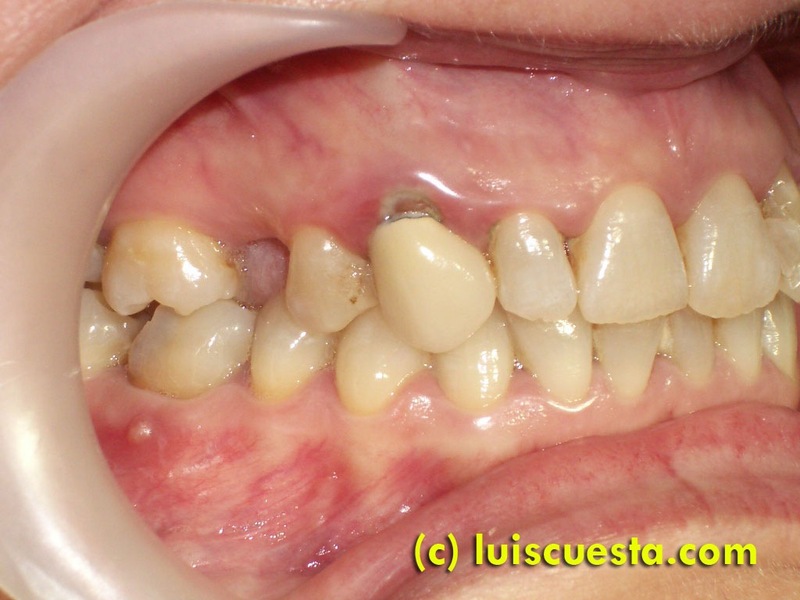 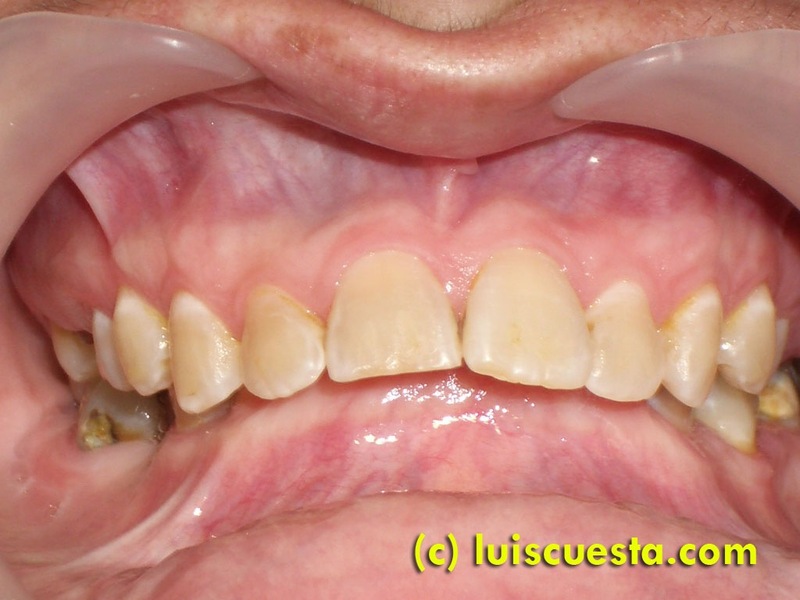 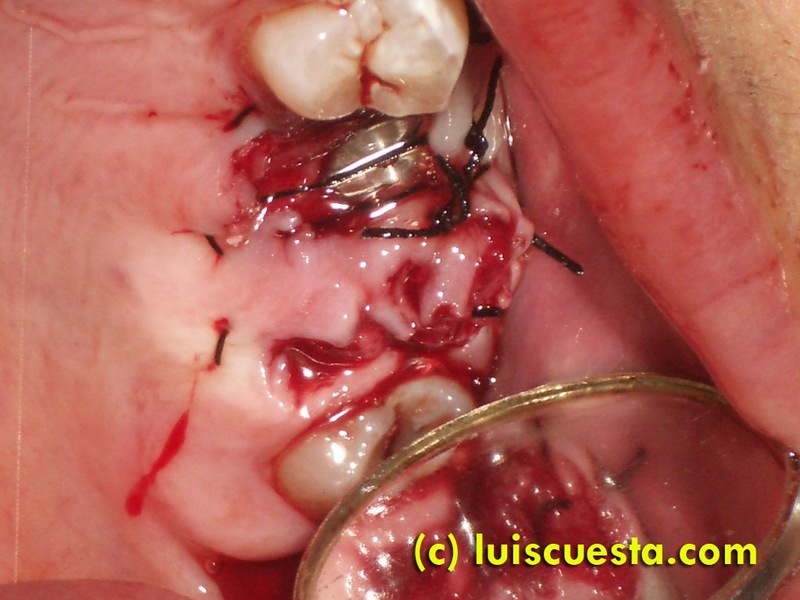 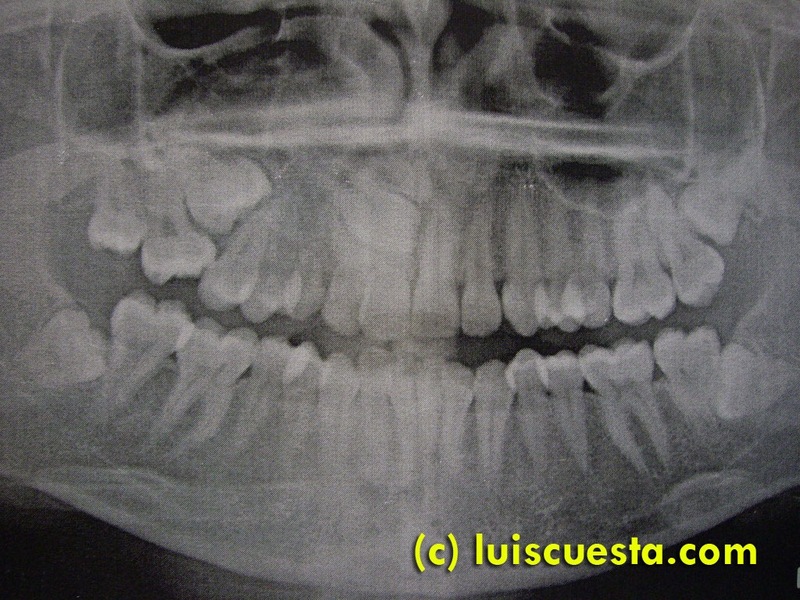 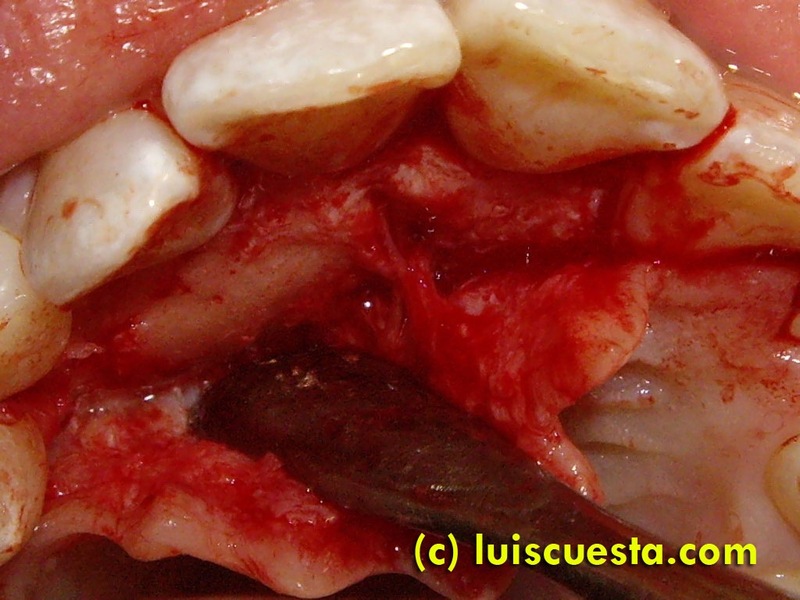 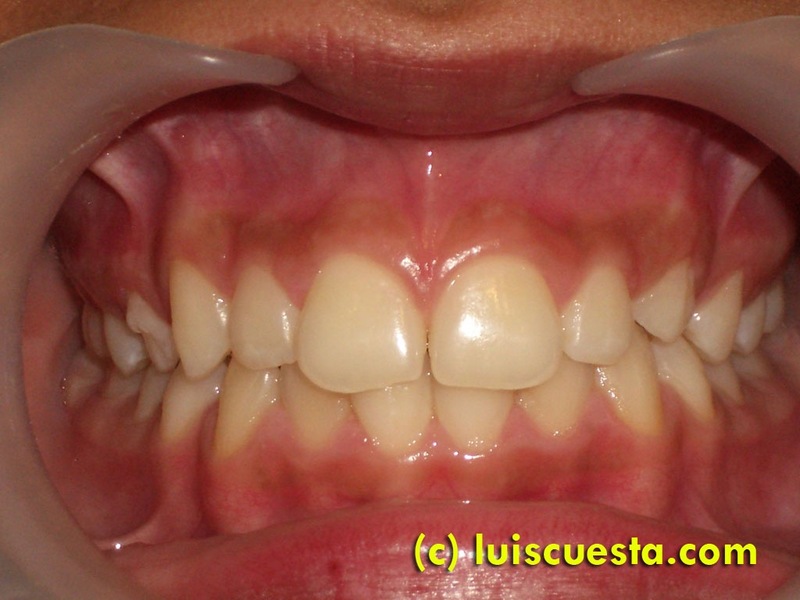 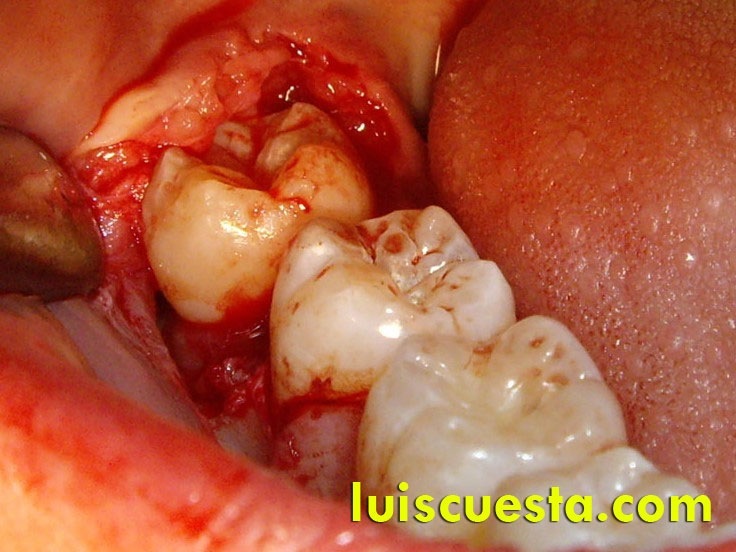 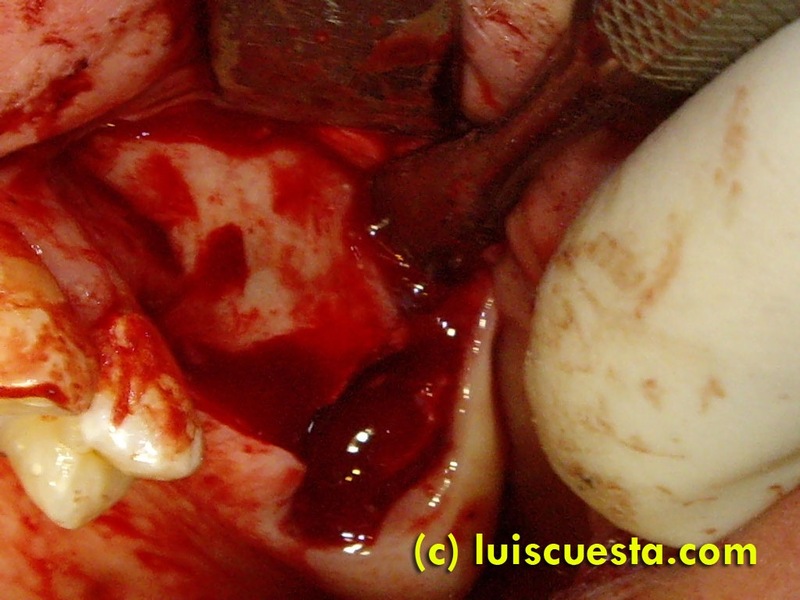 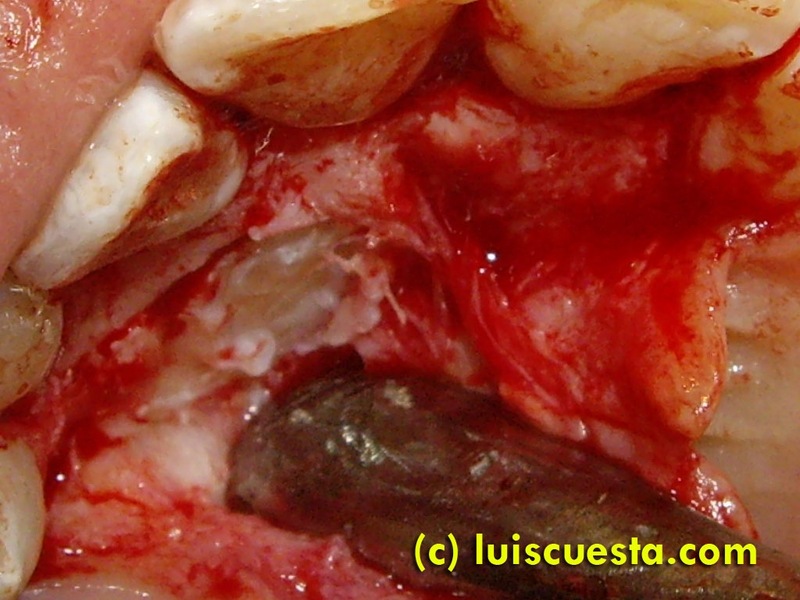 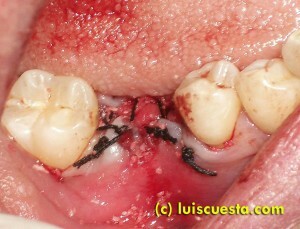 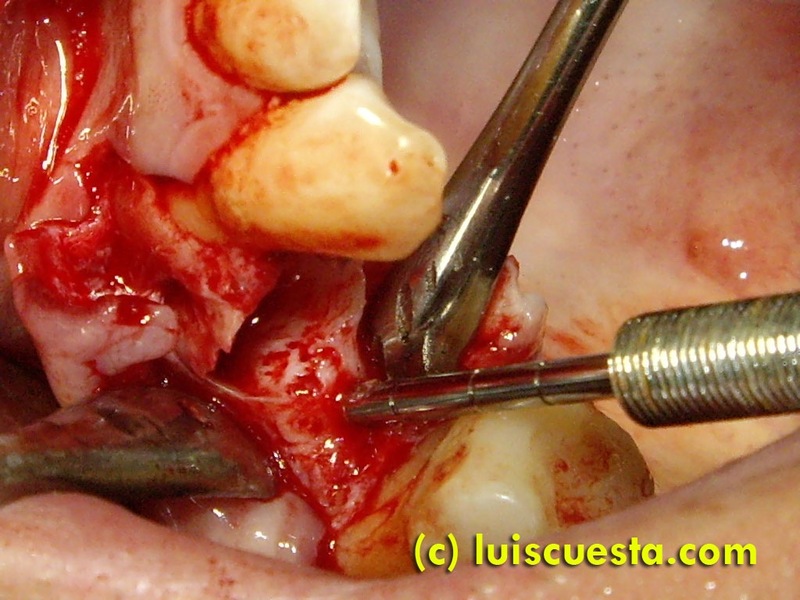 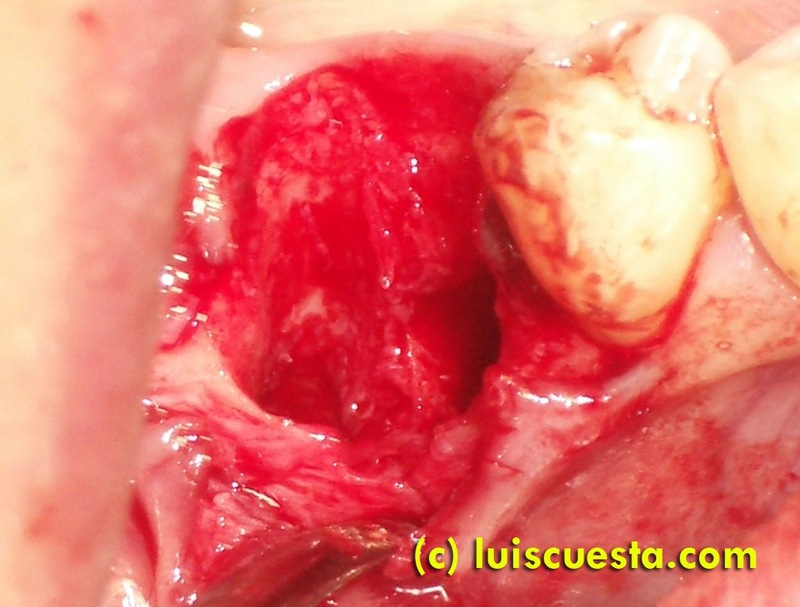 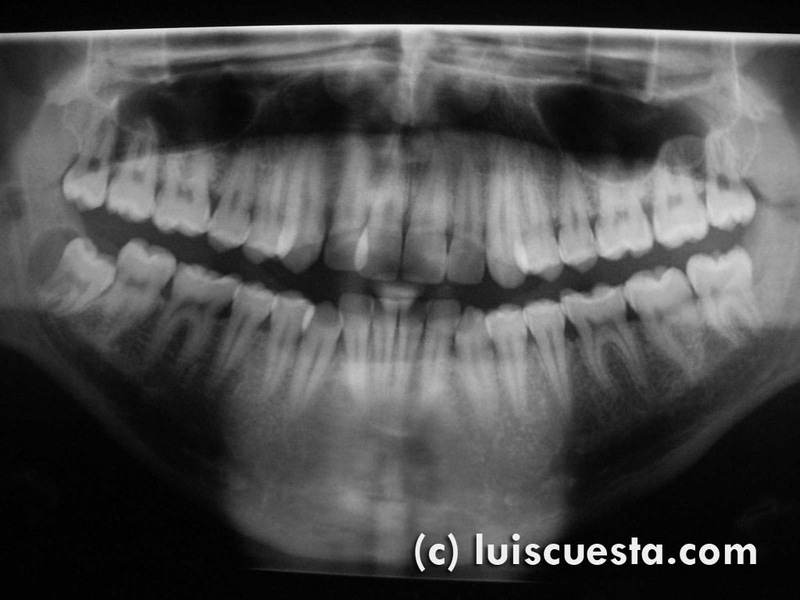 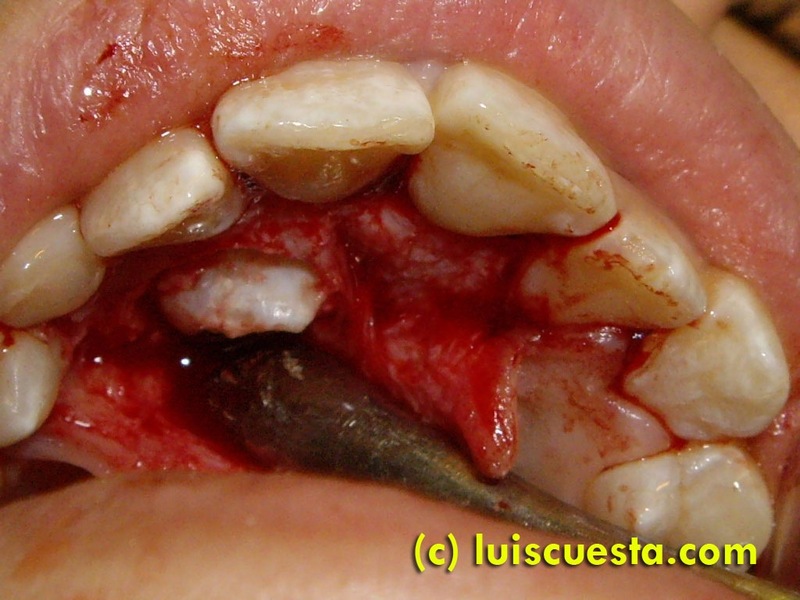 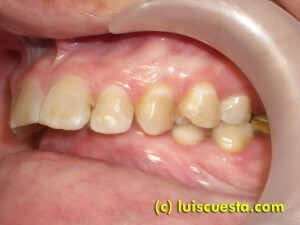 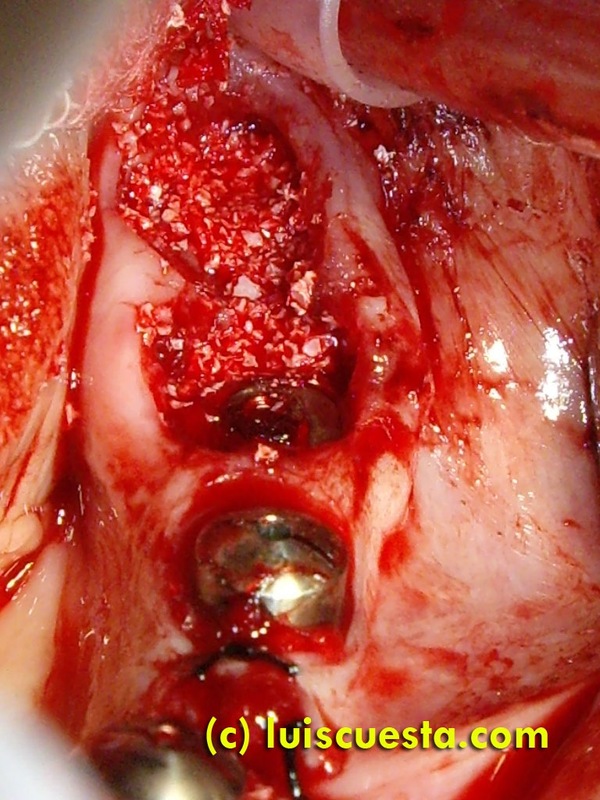 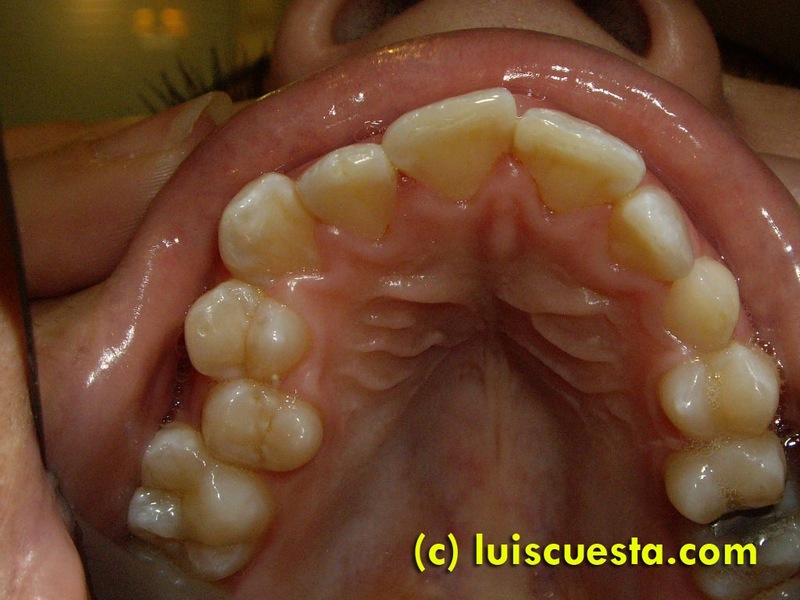 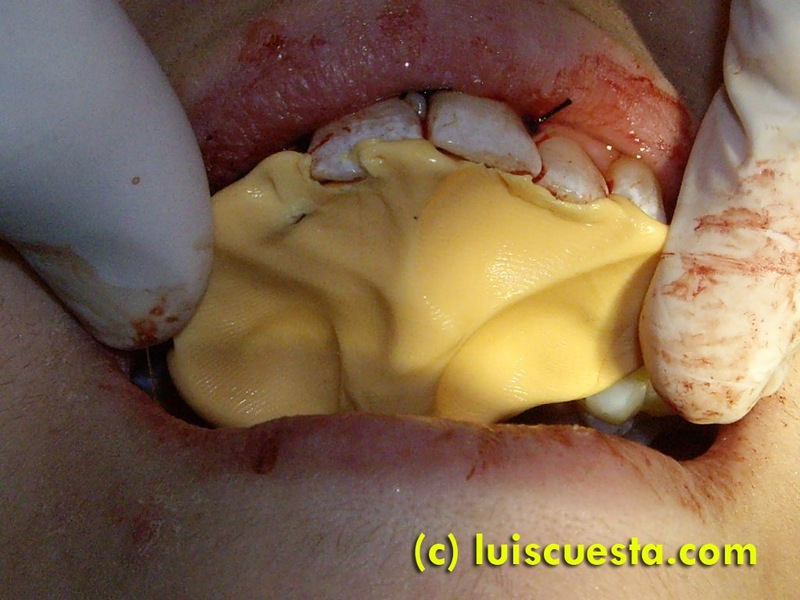 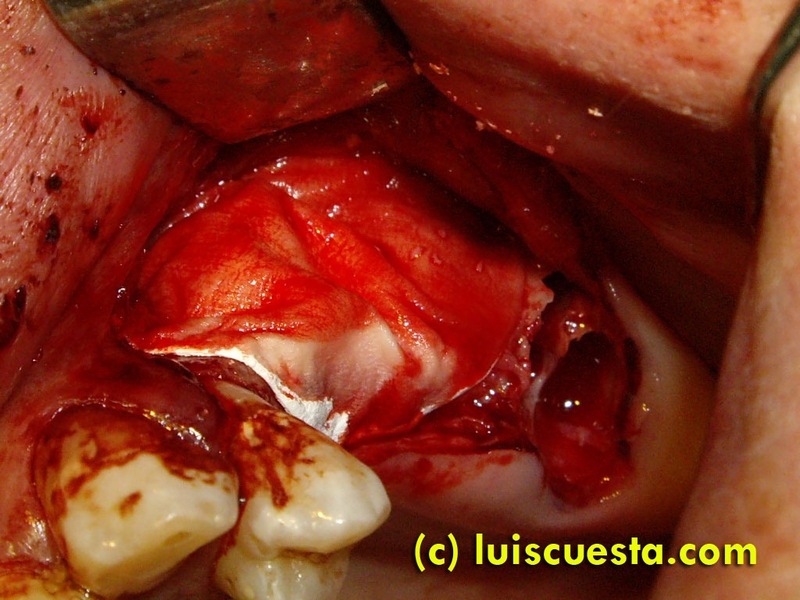 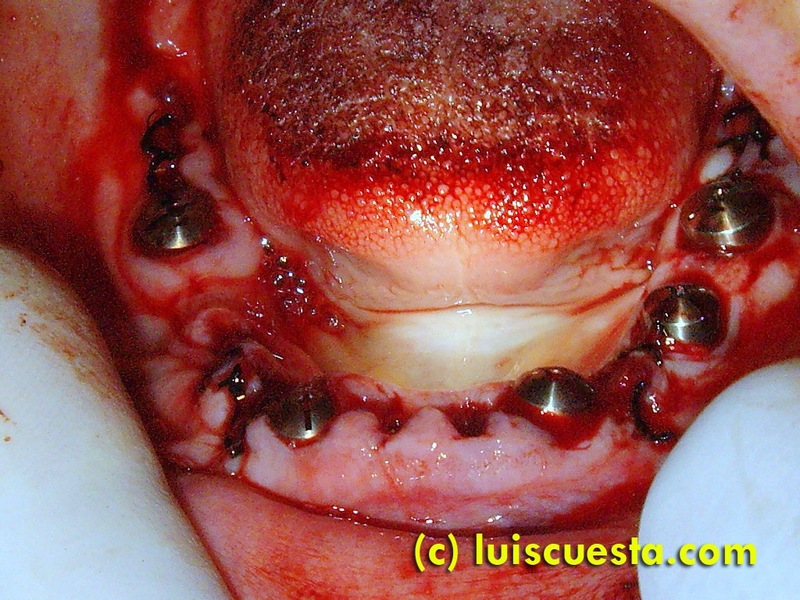 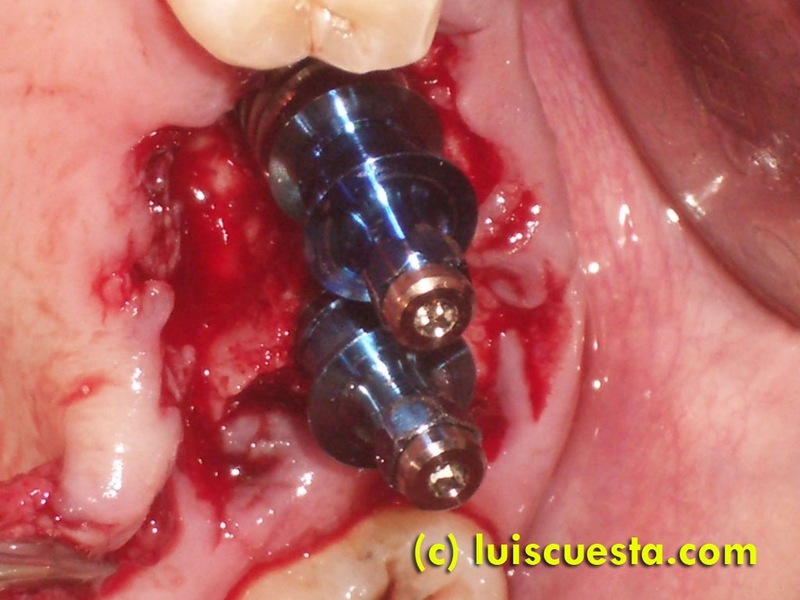 This case shows the extraction of a maxillary canine, impacted in the palate. 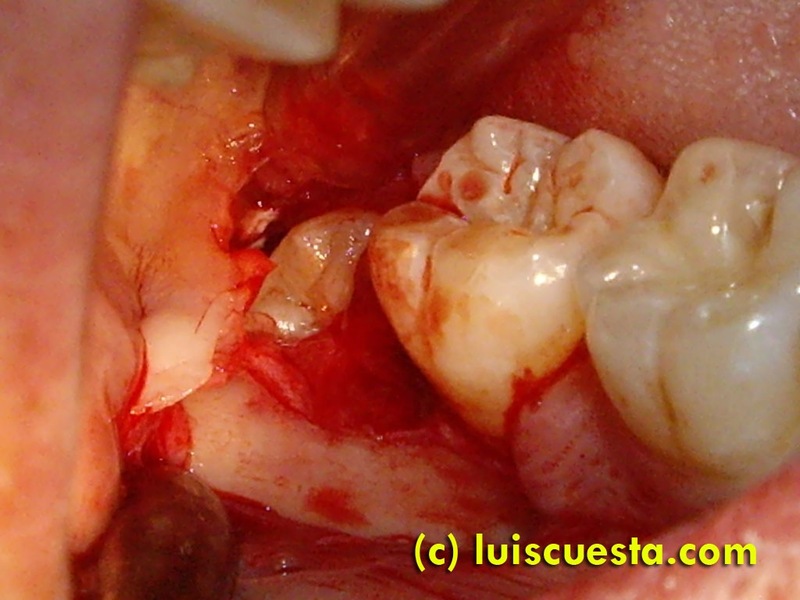 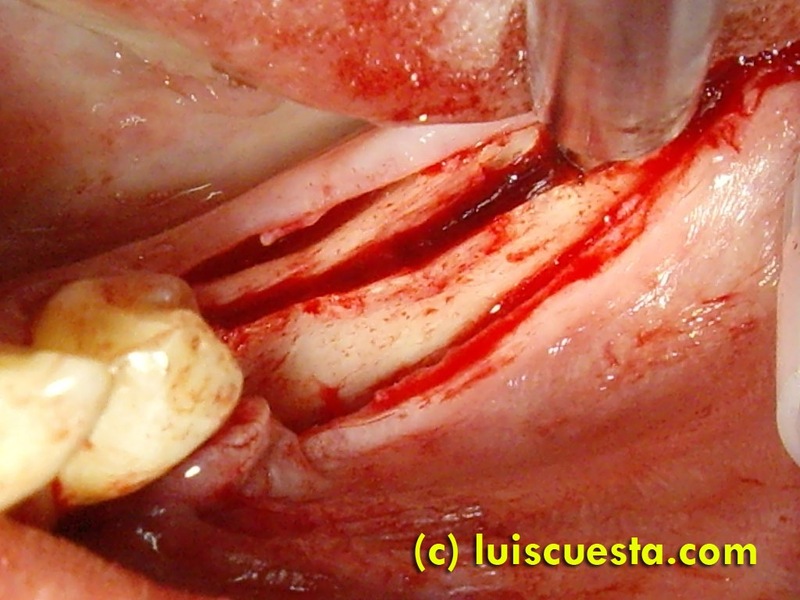 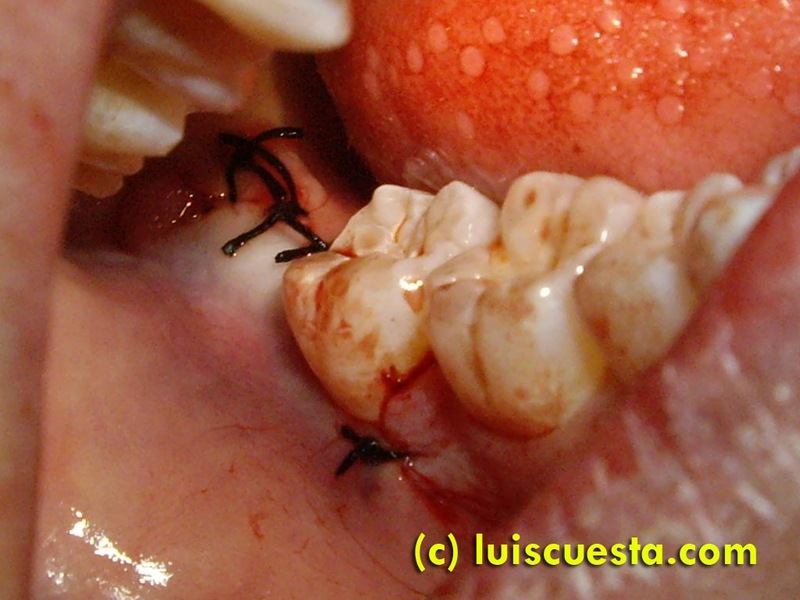 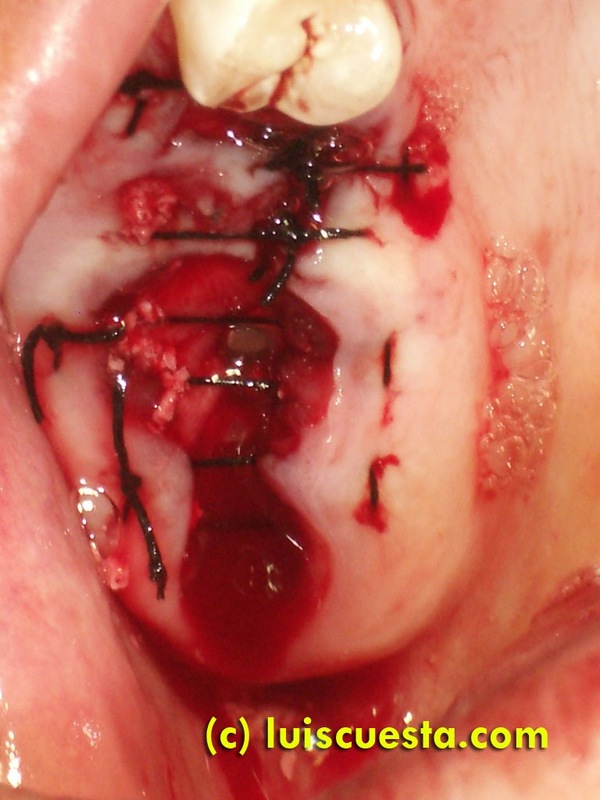 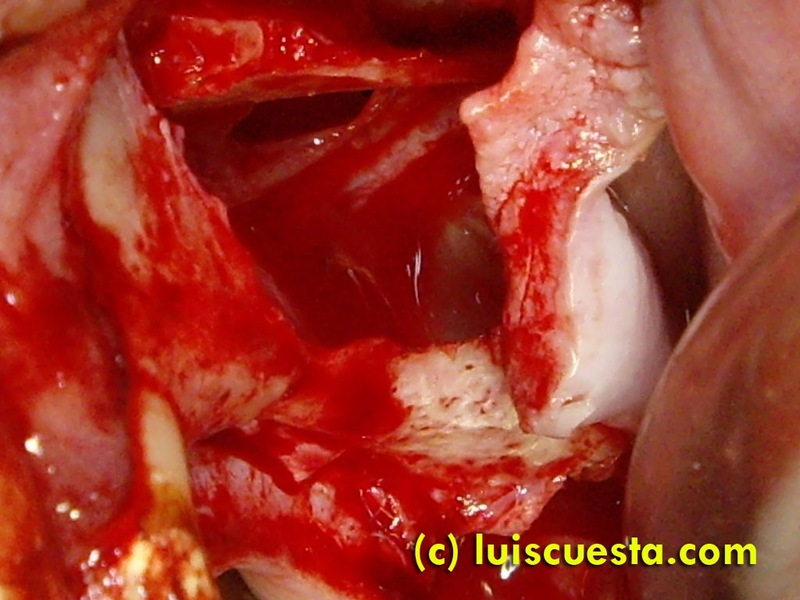 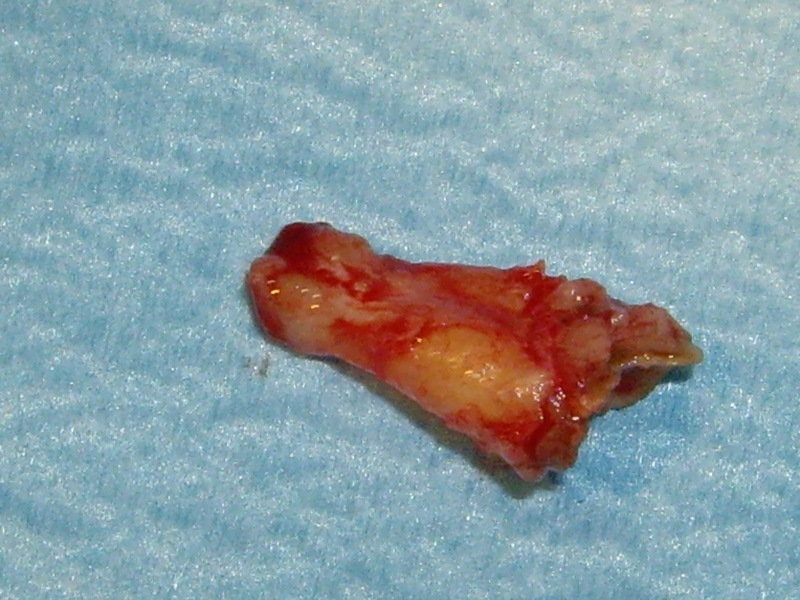 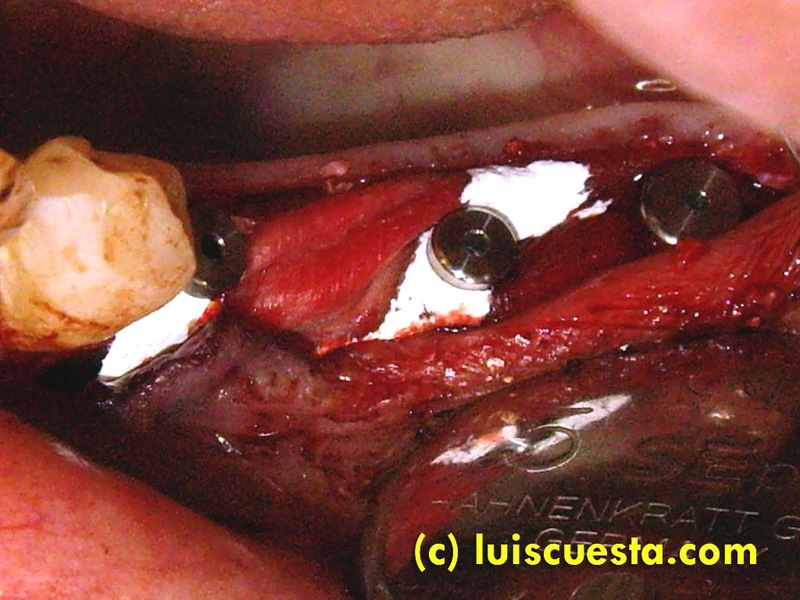 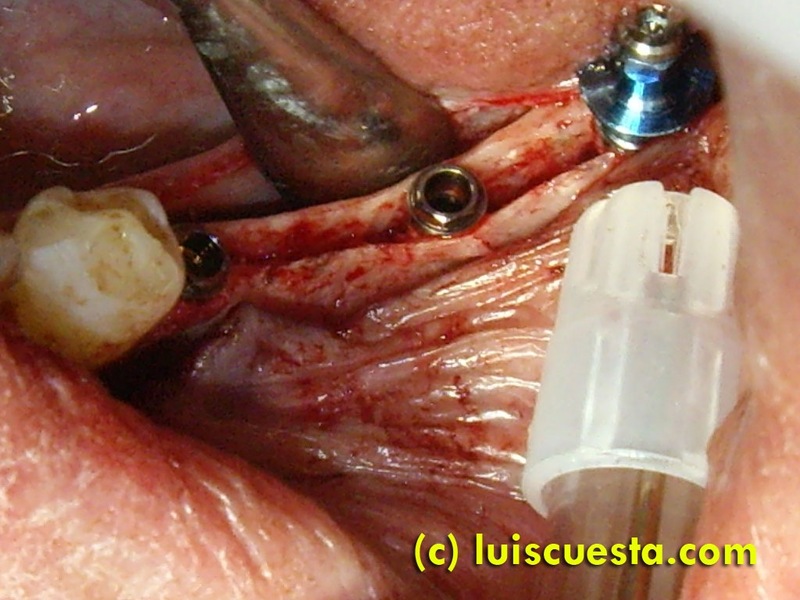 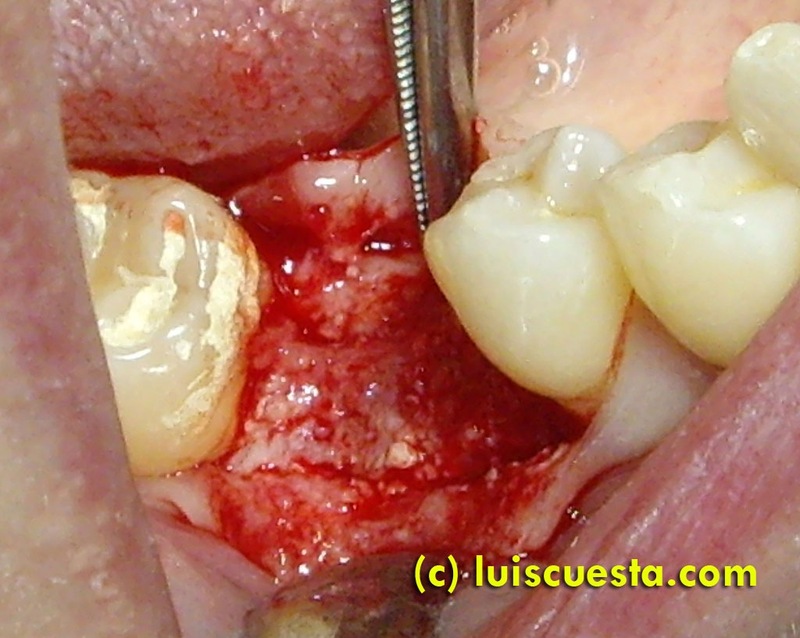 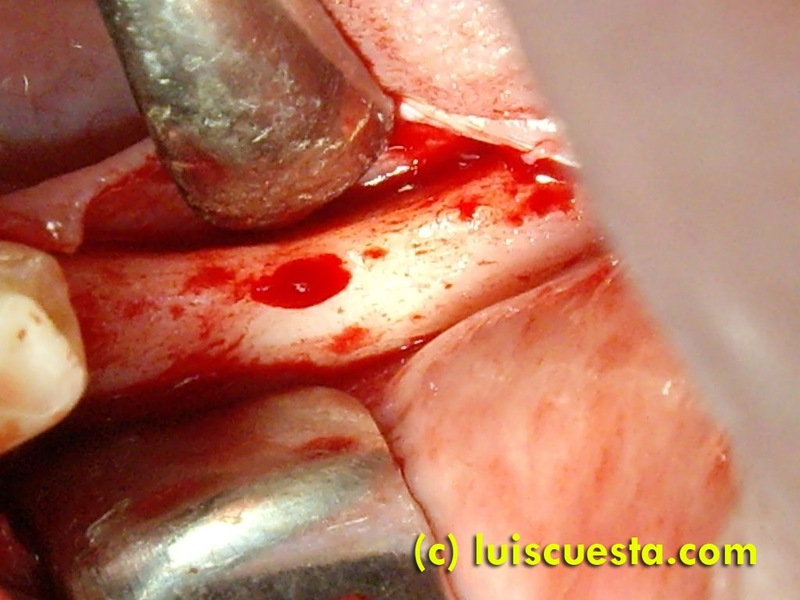 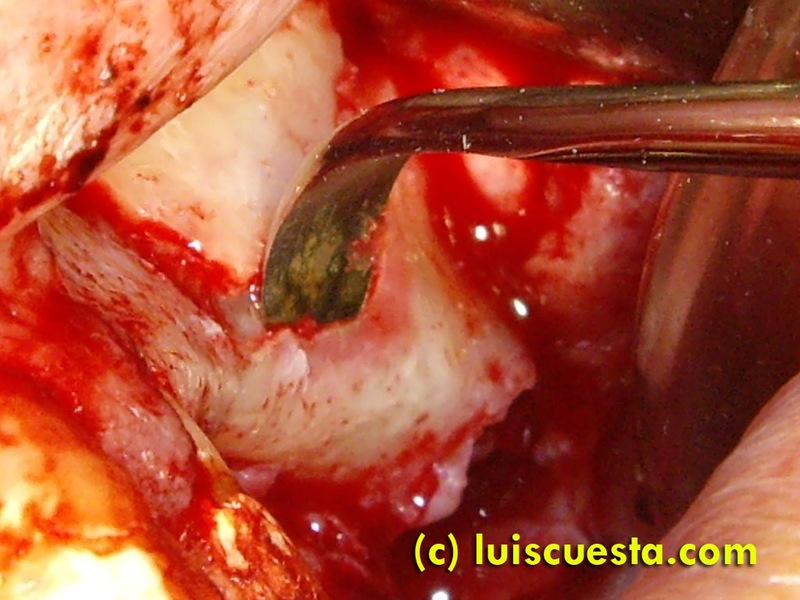 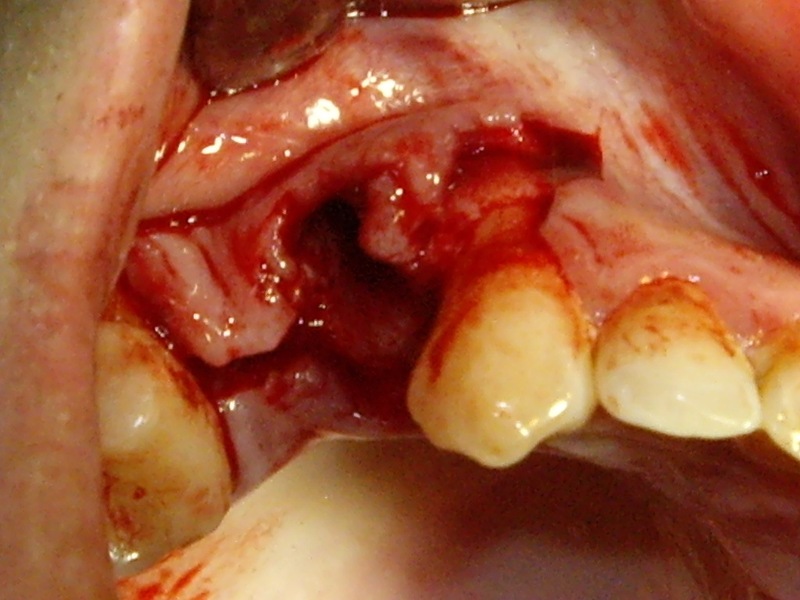 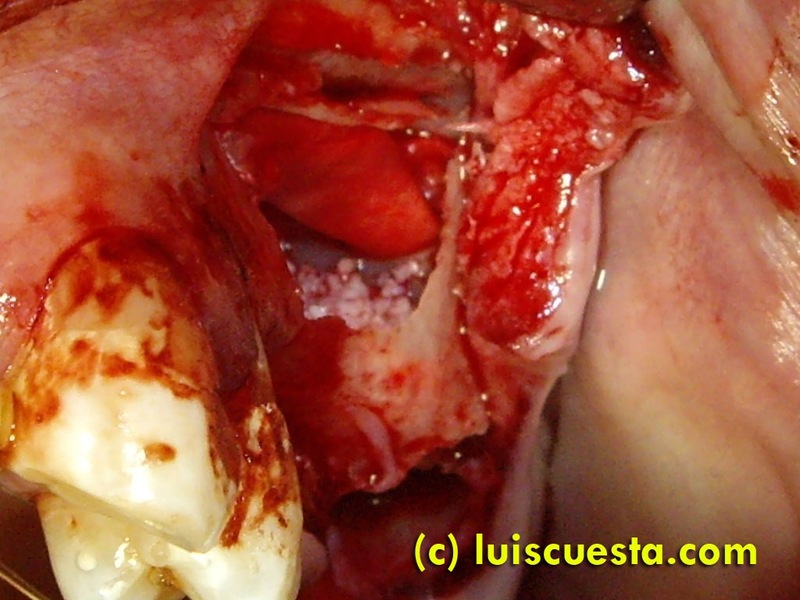 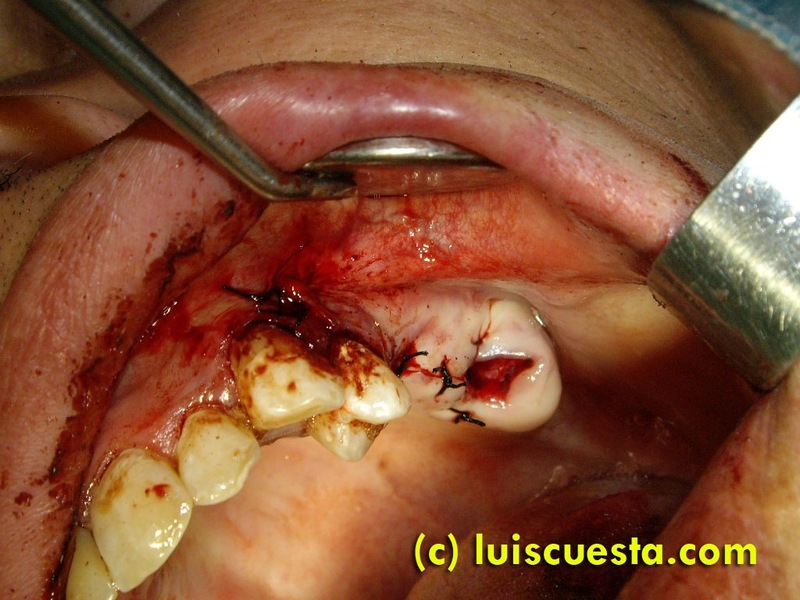 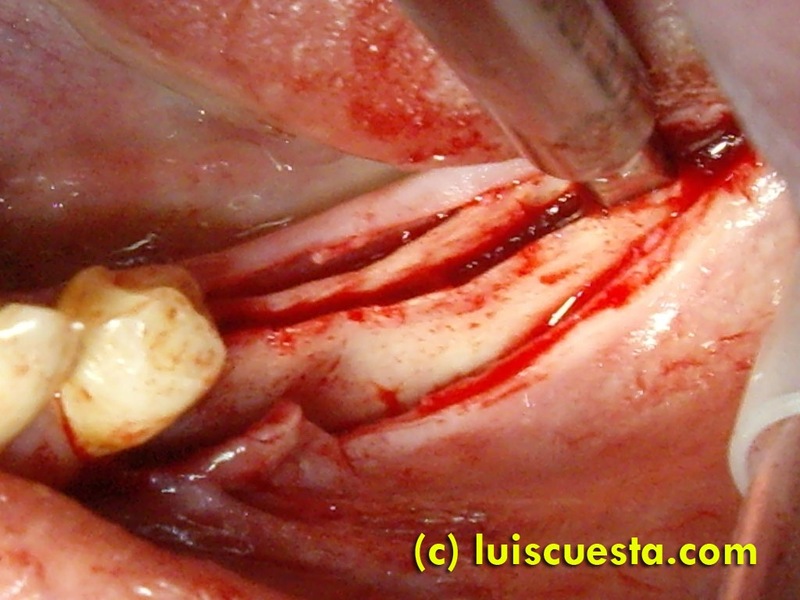 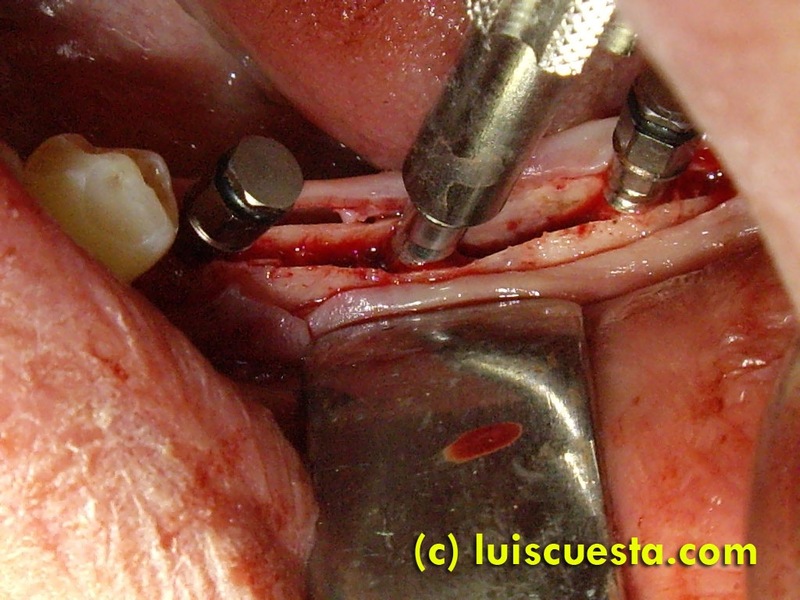 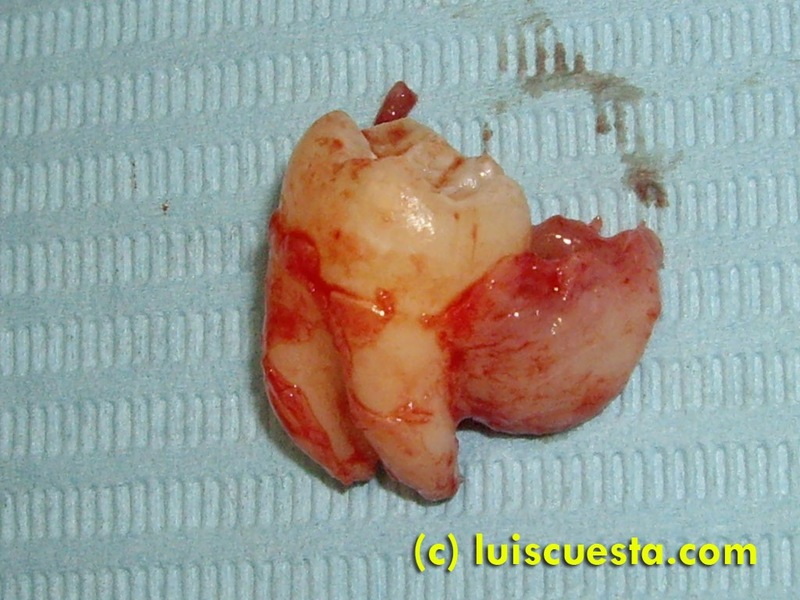 I open a flap in the palate, preserving the papilla, so I can stitch the flap back again. 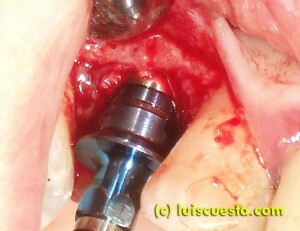 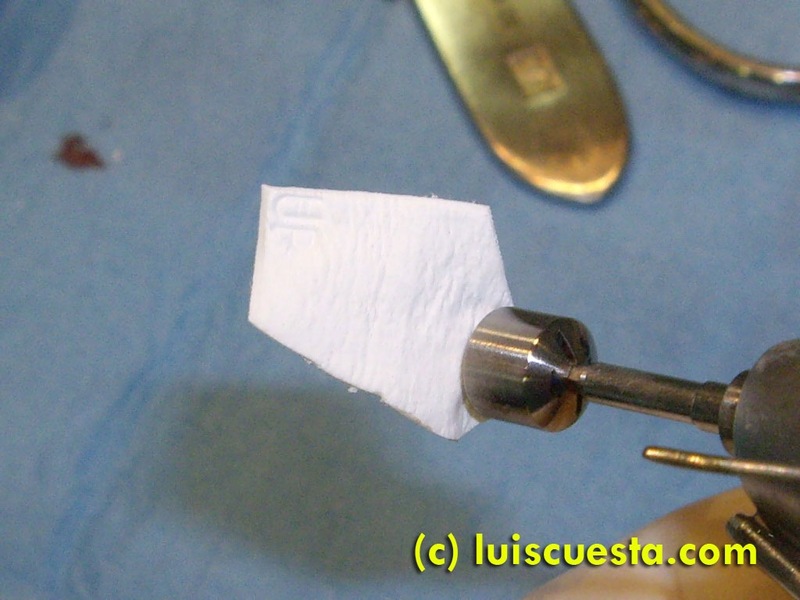 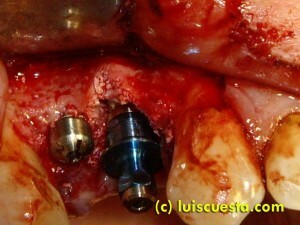 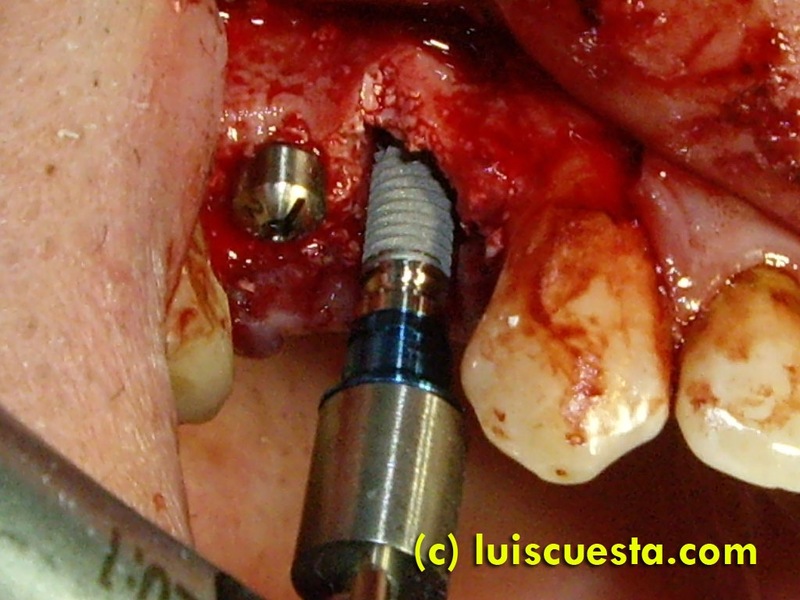 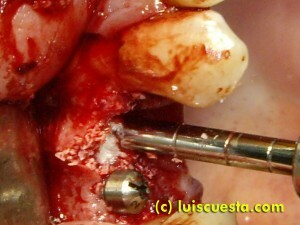 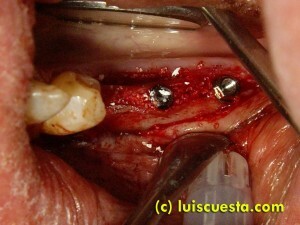 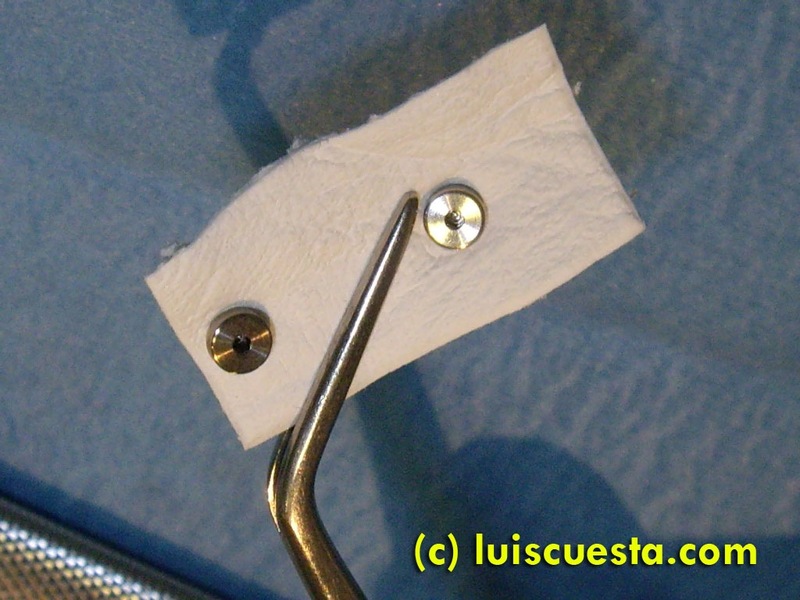 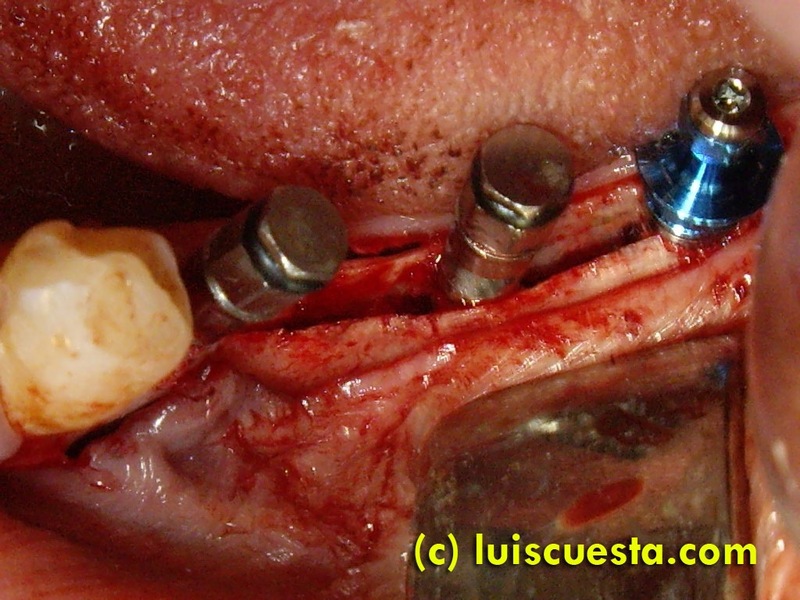 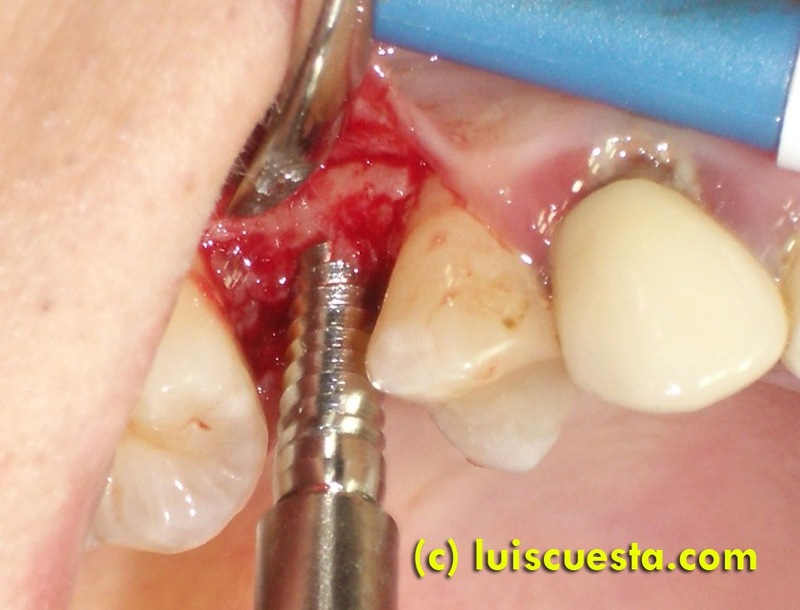 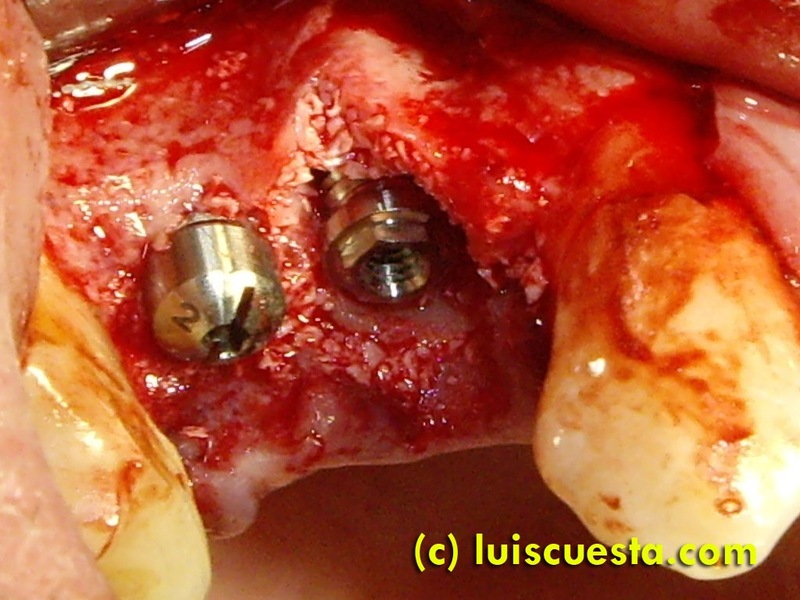 I calculate the position by the x-ray and start drilling the bone with a hand-piece until I touch the tooth. I know that because of its different hardness. I remove as much bone as I need to see the crown and I cut it with a high speed turbine drill. 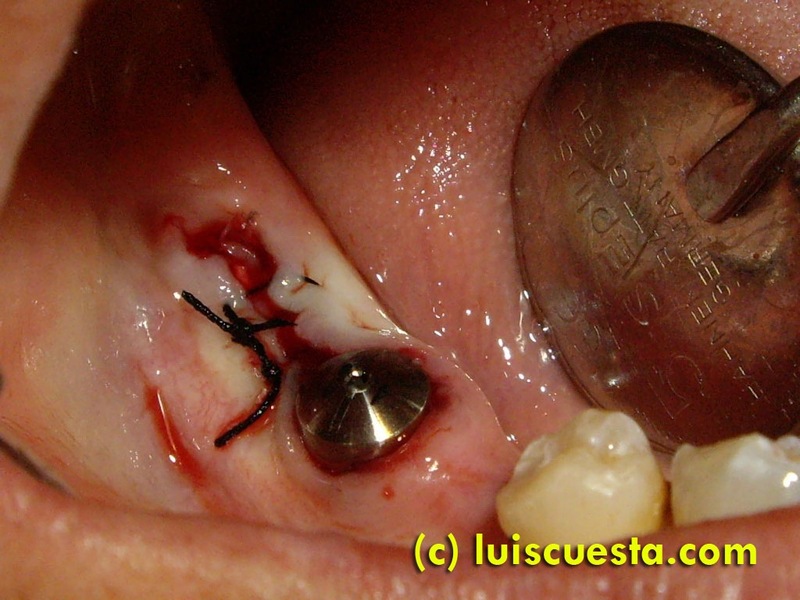 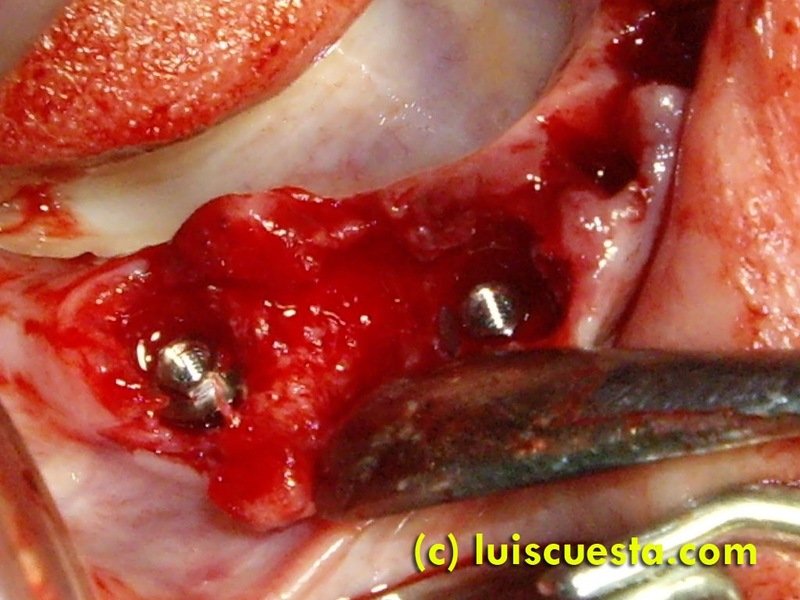 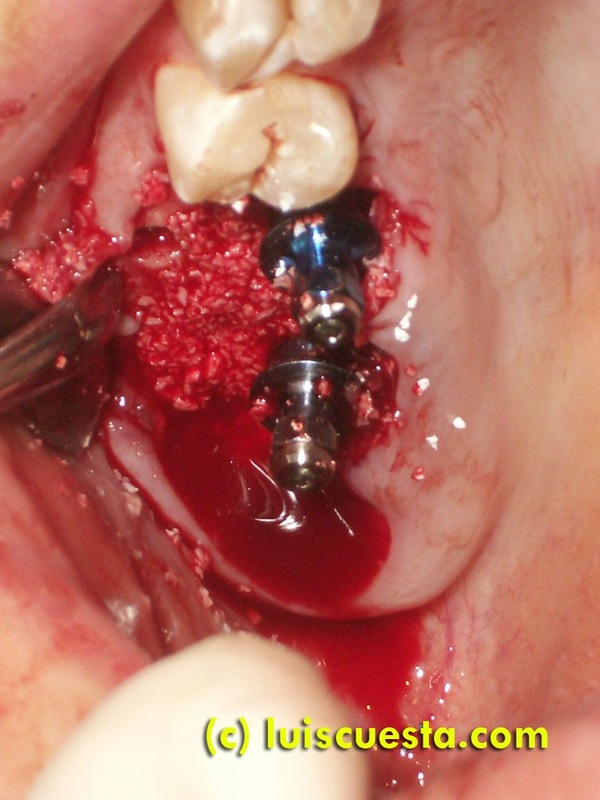 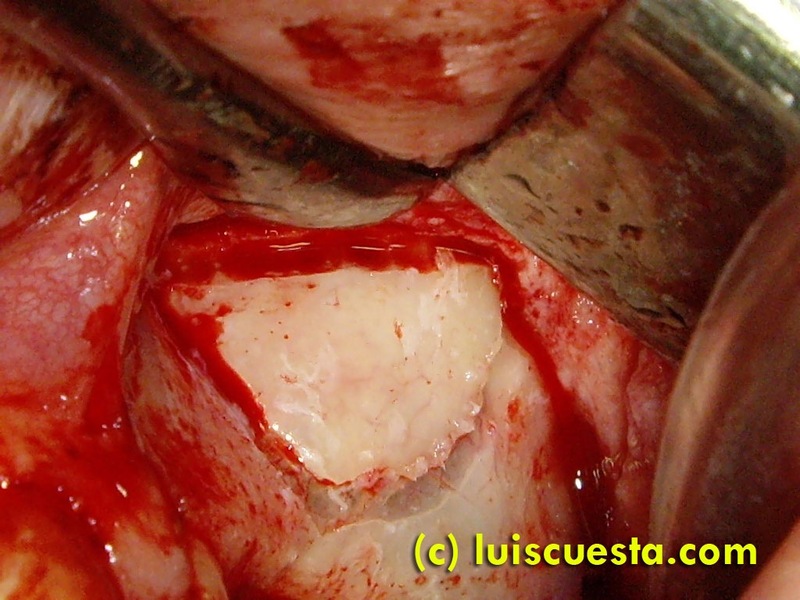 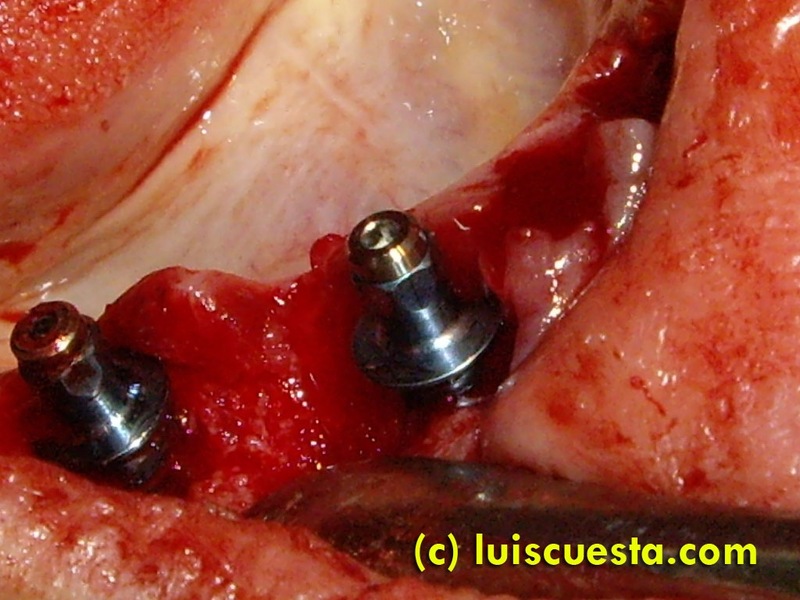 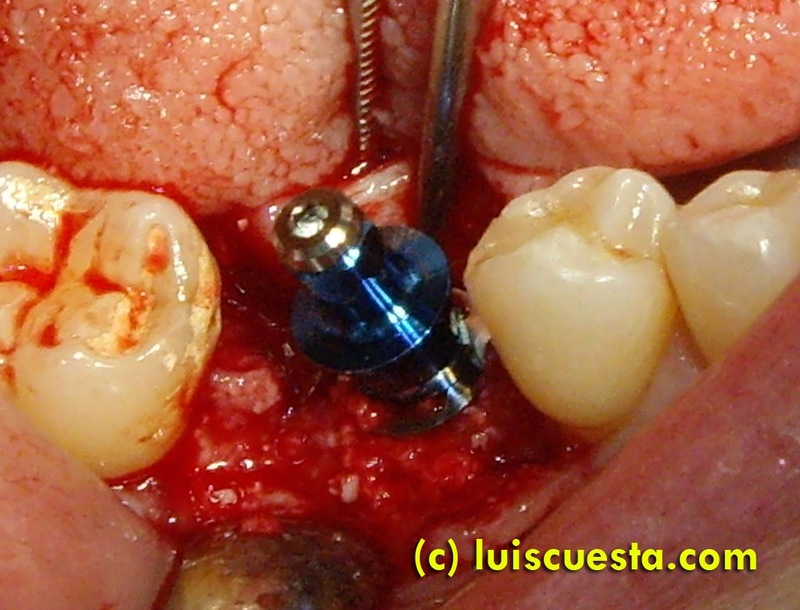 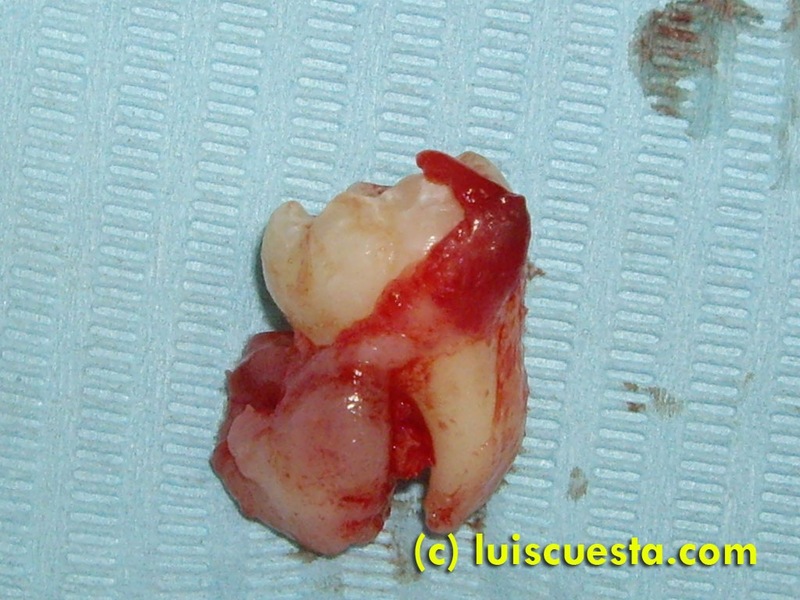 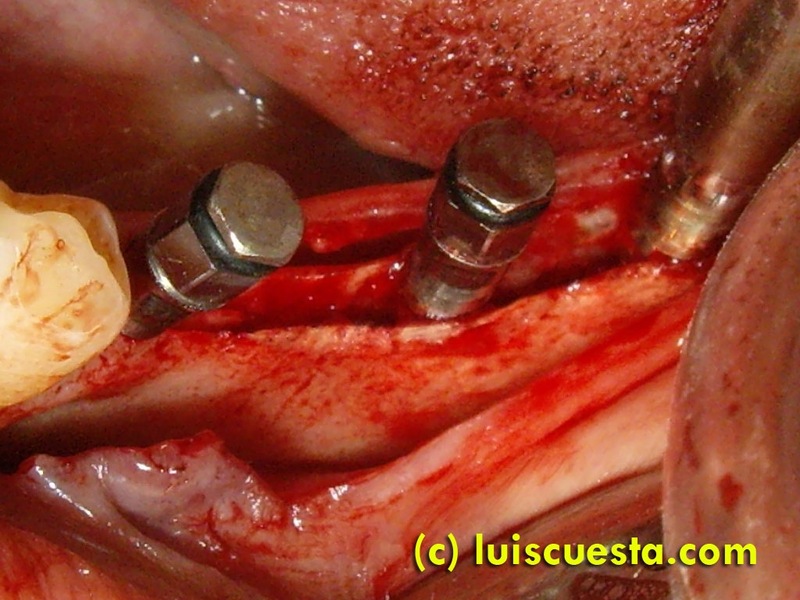 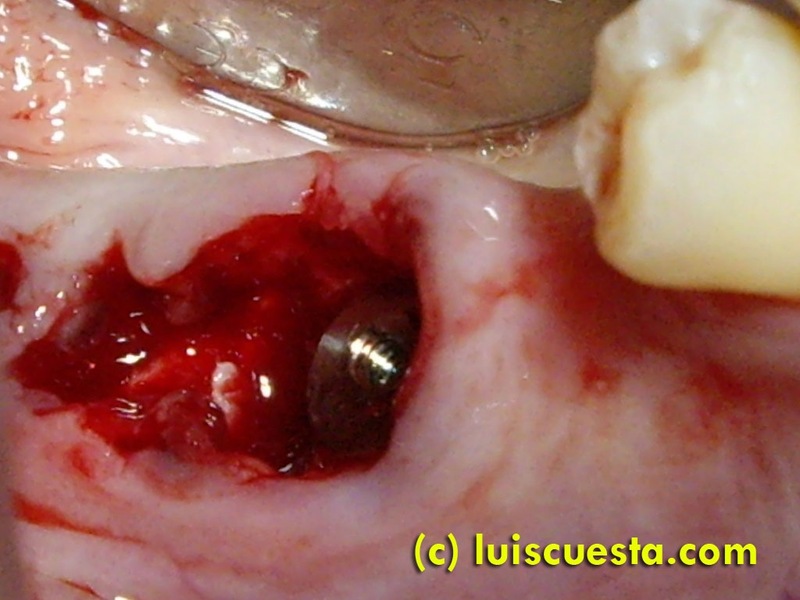 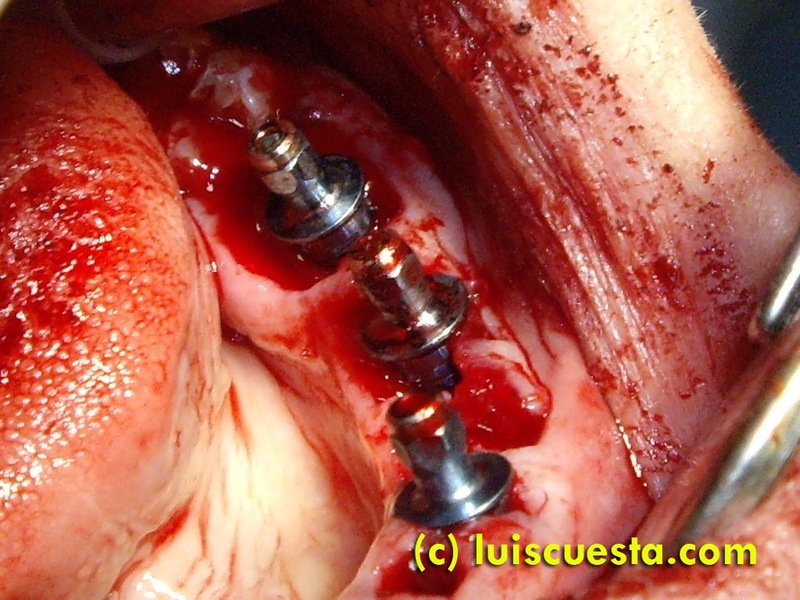 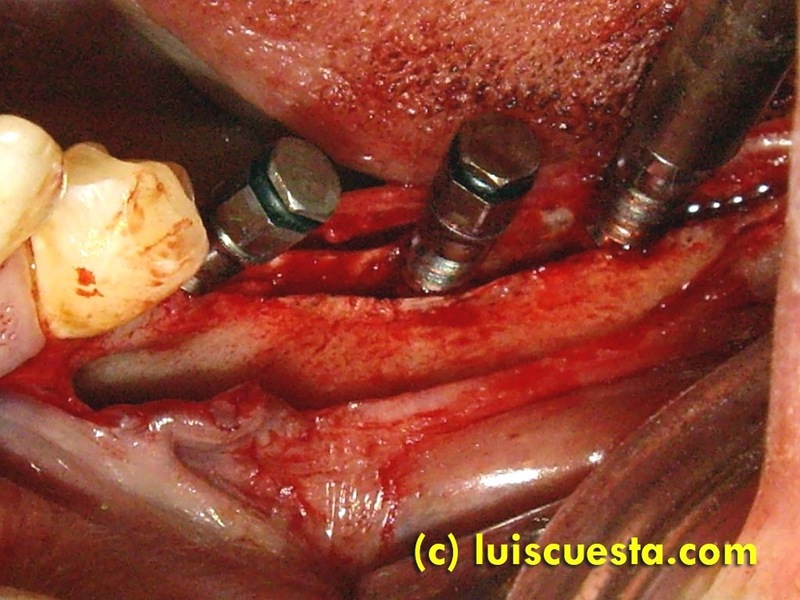 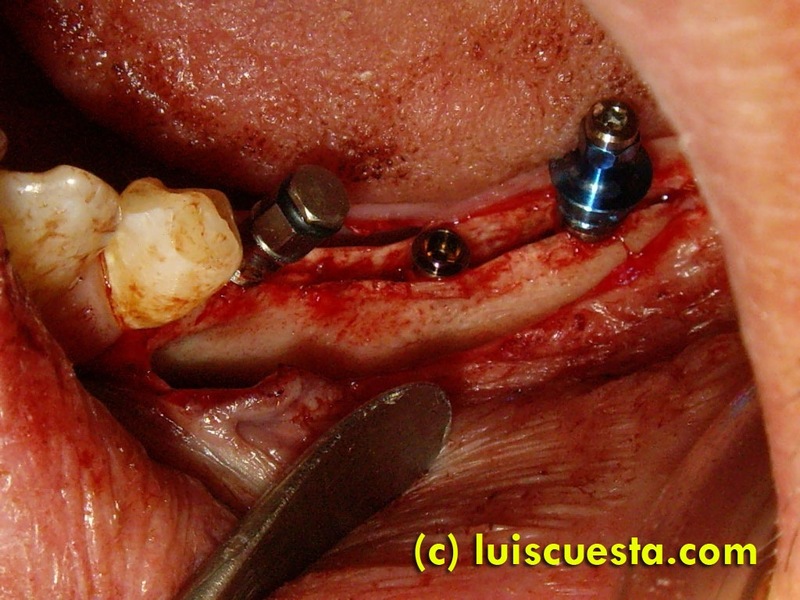 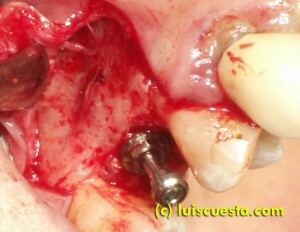 I keep removing bone until I can pull out the crown split part of the cuspid. 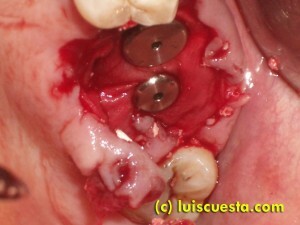 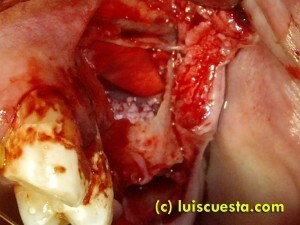 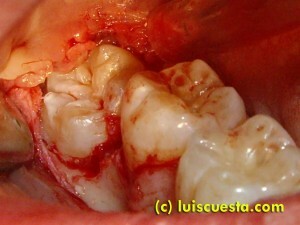 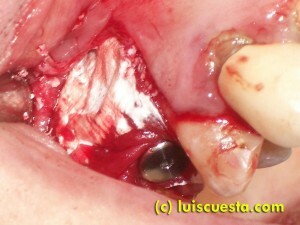 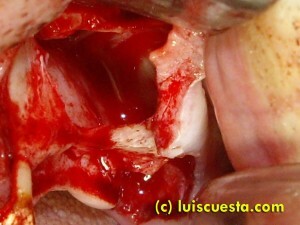 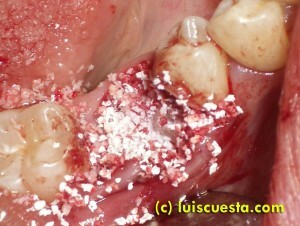 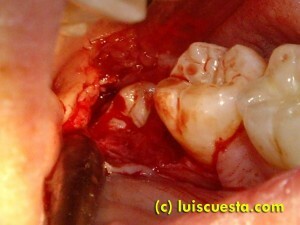 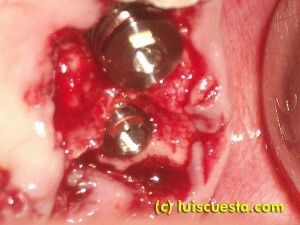 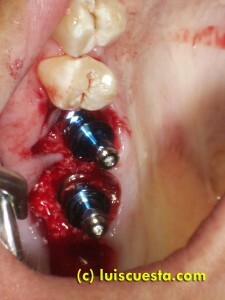 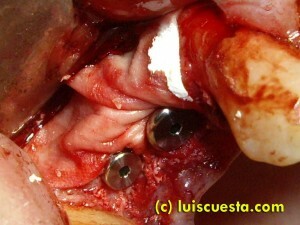 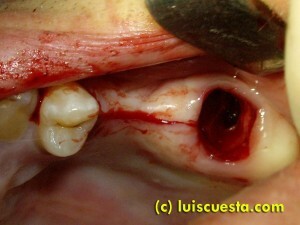 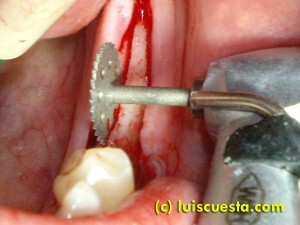 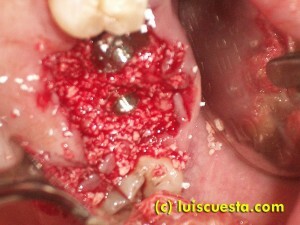 I work my way to remove the root end of the tooth, the soft tissue capsule, and I stitch the palate flap back in place. 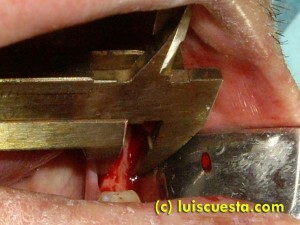 Literature speaks of swallowing or difficult, painful bonding of the palate flap over the bone. It is convenient to prepare a Hawley-type splint, or simpler, a silicone cast that the patient can bite on intervals. This applies enough compression on the palate to minimize swallowing, conducting to adequate healing. This small surgery is done to remove the frenulum, a small fold of tissue that prevents an organ in the body from moving too far. 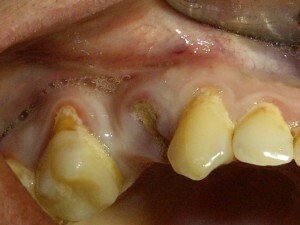 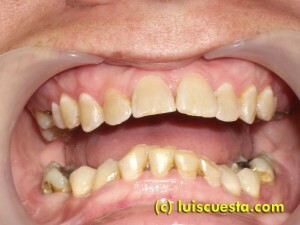 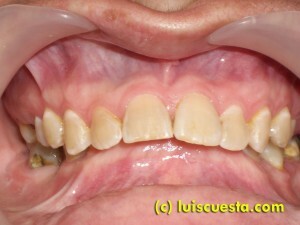 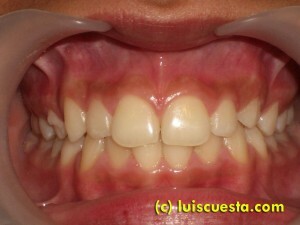 Strongly inserted frenulums may cause awkward mobility of the lip or tooth separation. Another surgical technique is the Z-plasty, normally used for bigger frenulums. 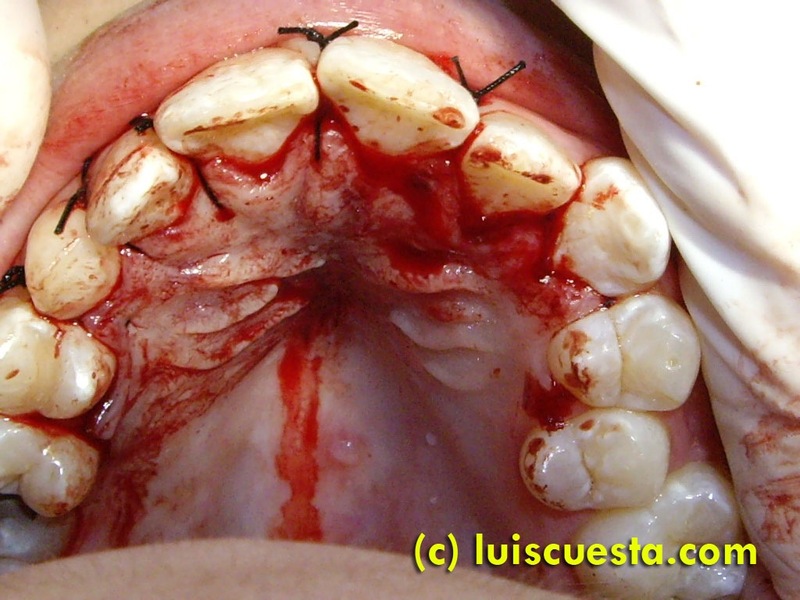 gently passing the electrode over the frenulum while pulling off the lip allows the tissues to shape up differently. The electro-scalpel both cuts and coagulates as needed. 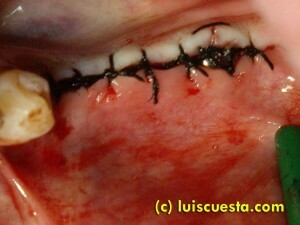 So, healing is fast and without stitches. This is the healing a week after surgery.